The high-temperature warning will alert you if the temperature rises (i.e. 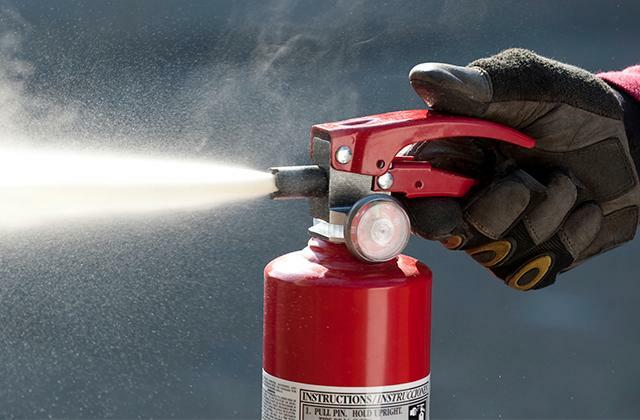 a fire occurs) and unblock the door to help you evacuate. The mortise mechanism is clunky and very noisy. 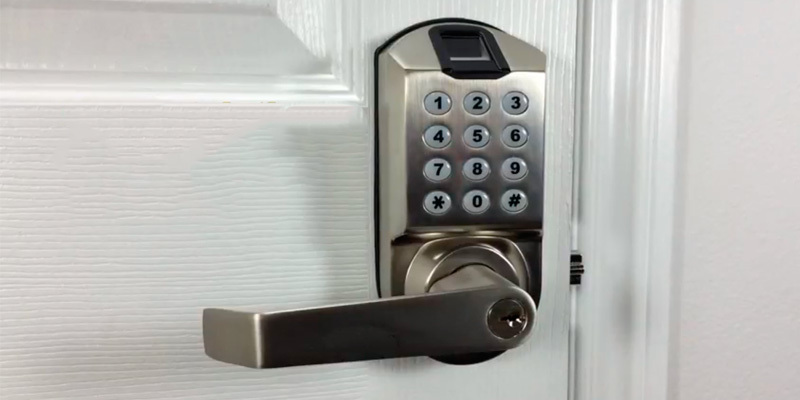 This is one of the most advanced locks on the market and though it's noisy mechanism makes it more viable for front door mounting, the Samsung system is extra secure and safe. 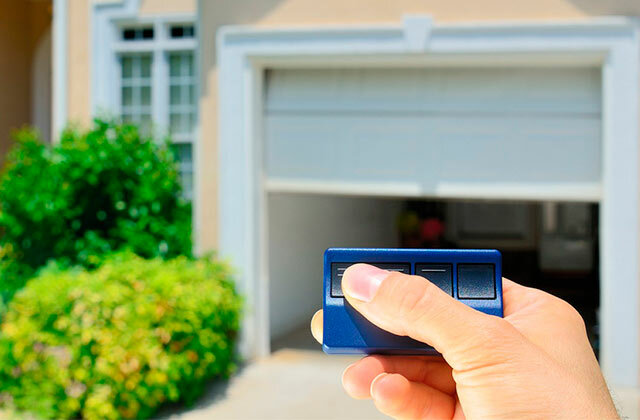 With multiple access methods and high compatibility, this is a guaranteed boost to your home's security system. 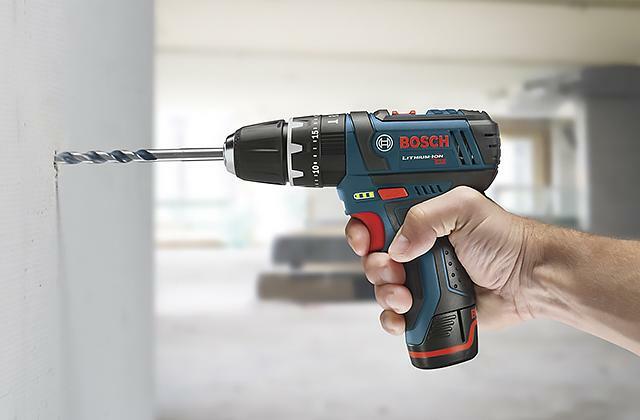 The advanced technology here opens the lock in just 0.5 seconds. Only fits a narrow subset of doors. 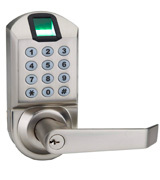 If you want a lock that will stop any unwanted guests in their tracks while not slowing down authorized access at all, this modern model is a great choice. You can open it via a variety of ways as well, so it's a great multi-option choice, as long as your door is compatible with this one. The system stores up to 100 unique fingerprints or passwords so multiple users can have access to the premises. The housing is not scratch-resistant. This lock's double verification system is an excellent choice for offices as it stores up to 100 passwords and fingerprints, granting access to all authorized personnel but stopping any intruders in their tracks. It's a simple yet secure solution. The voice guide feature will help new users and visually impaired people along. The batteries don't last as long as stated (about 6 months). For those who aren't adepts of new technology, this system offers voice tips and multiple unlock options, so you can always gain access to your room while nobody else will be able to. It's a good choice for home use although you have to make sure to swap out the batteries regularly. It's one of the more user-friendly models out there for sure. The batteries will be enough for over 6000 lock openings, saving money in the long run as well as preventing accidents where the system shuts down at an inopportune time. Using a key to open the door requires taking the whole handle off. If you want a system that's reliable and can be installed on multiple doors in an office without draining your budget, the ZKTeco lock is a great find. It comes with a useful control app that lets you track visitors and block the door remotely and it's very affordable and durable. Perfect for a corporate environment as well as home use. Having a touchscreen keyless entry system seems like a cool idea but their depiction in movies might scare some people off. After all, nobody wants to get stuck in a room that’s on fire while the keypad just stops working. 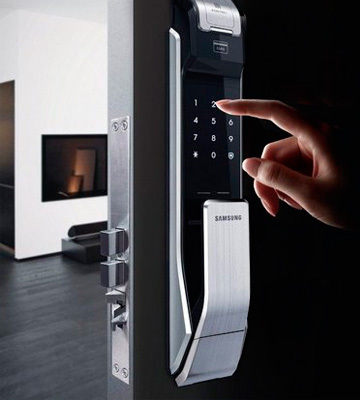 Thankfully, that’s no longer an issue for smart lever systems such as the Samsung SHS-P718-LMK. This model has a built-in temperature reader that will sound a warning if the level gets too high and unlock the door promptly to let you evacuate. 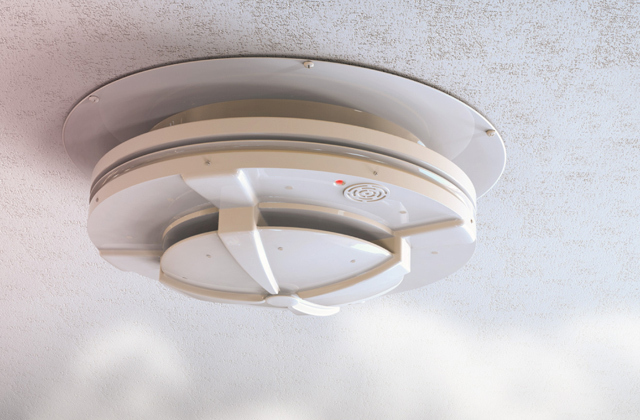 It’s a huge step towards fire safety as you won’t have to input any code to get to the outdoor area. But that’s not the only advanced feature of this lock, of course. The Samsung SHS-P718-LMK can be opened using your fingerprint, a number pad, an RFID card or tag, or even a simple key if all else fails. That way you can give access to the premises to several people (employees or family members) without compromising security. 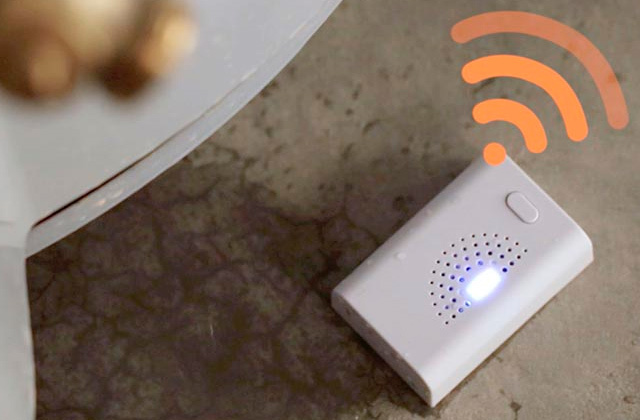 Plus, the system even detects suspicious movement, so if a would-be thief sneaks up to it in the middle of the night - you’ll be alerted. Our only complaint would be about the rather noisy mortise mechanism on this lock but, let’s be honest, it’s a very minor issue, especially if you put it on a thicker door that would close loudly anyway. This might make the Samsung SHS-P718-LMK a suboptimal choice for bedroom doors but it’s perfectly fine for apartments and offices alike. 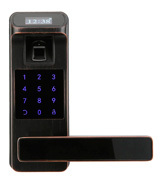 This model can be installed into doors in a wide range of thickness and is pretty much a universal security measure. 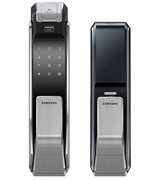 The Samsung SHS-P718-LMK is certainly a strong contender for the title of the best fingerprint door lock out there. Keeping data confidential in an office is essential but it’s not always easy. After all, a push pull door won’t do much to deter would-be snoops from looking at things they shouldn’t. 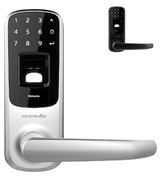 Luckily, the Ultraloq UL3 is a lightweight fingerprint-scanning lock that’s perfect for glass door mounting, a staple of the modern offices. 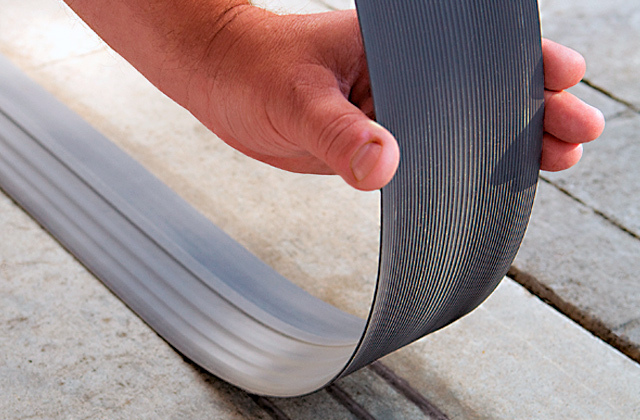 Although this system is only compatible with doors that are 1.375” to 1.75” thick, which limits its usage somewhat, the restriction does, in fact, make it a prime candidate for thin doors. It’s also a great choice for offices because the scanner here is fast so multiple people can gain access to the room in a row with each entry accounted. 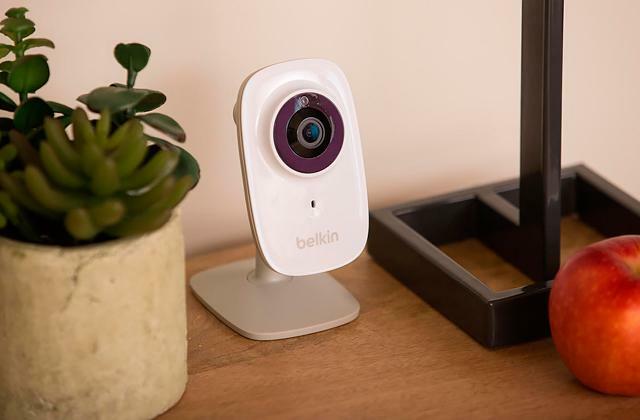 The lock opens in about 0.5 seconds after the sensor is activated and you don’t have to worry about the sensor itself failing you as it’s scratch-, dust-, and waterproof. If you’d like to open the Ultraloq UL3 up without using your thumbprint, for whatever reason, there are other ways to gain access. You can use a good old key (only 3 copies available so only give one for right hand people that you trust), a number pad, or disengage the lock using your phone via Bluetooth. That should be pretty easy thanks to the unusual yet self-explanatory Knock-to-Open (iOS) and Shake-to-Open (Android) functions. Protecting your sensitive personal information or belongings is important in the modern age when identity theft isn’t out of the regular. But sometimes even a basic fingerprint door lock is not enough. 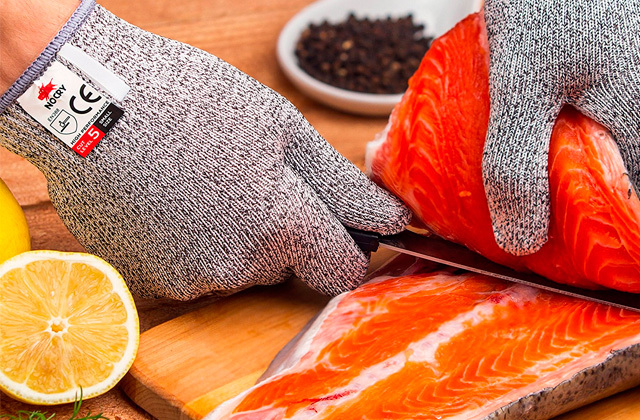 If you want an extra layer of safety, try the Ardwolf A1. This model uses double verification to up the security level, requiring more to enter and, thus, harder to cheat. The system is capable of storing up to 100 unique thumbprints or 100 passwords, which makes it perfect for installation in a corporate office. You can access the lock and disengage using either fingerprints, a password, or a key, in case the AA batteries in the system run out. They should, however, last for a long time so that’s just a precaution. Although the compatibility is pretty good on the Ardwolf A1, available for mounting on doors from 1.375” to 2.375” thick, we can’t say the same about the lock’s design itself. The housing isn’t scratch-proof so the system might lose its brand new look in a few months of use. But you’ll be buying the Ardwolf A1 for its security, not its looks, and the former is certainly excellent here. 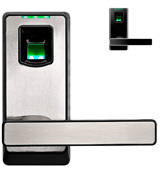 If you’ve got safety on your mind, let this system relieve your worries and provide security for your home or office. If your parents’ health is declining and you want to make sure their home is safeguarded against intruders, it’s a good idea to get a fingerprint door lock for them. However, not everybody is well-versed in such technology. 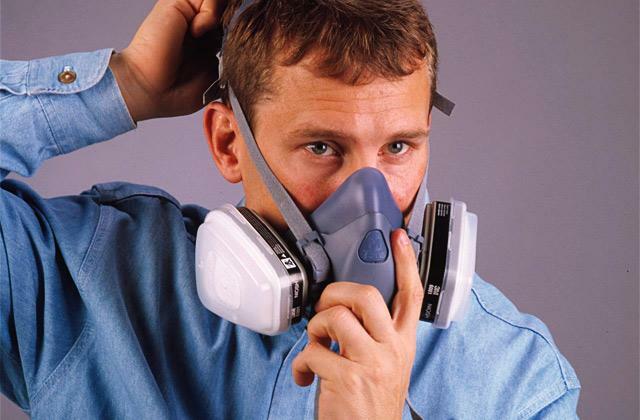 Luckily, there’s the HARFO HL91 system, which is perfect for such purposes. This system offers an English voice-guide to help along those who haven’t quite gotten the hang of the lock’s workings. And, since older people might have impaired vision, you’ll be happy to know that the voice guide offers help on using the thumbprint to open the door. 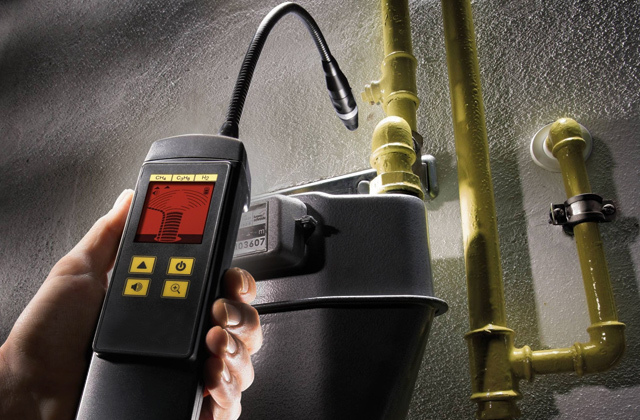 For the sake of convenience, the HARFO HL91 can be opened using a fingerprint, a password, a key, or an RFID card or tag. With this bevy of choices, you can rest assured that those authorized will always have access to the room. Although we’ve found that the 4 AA batteries in this system don’t last as the manufacturer promises, they’re still enough for 6 months. If you install this system in your home, which means it won’t see all that much use, they might even sustain the lock for 9 months or so. 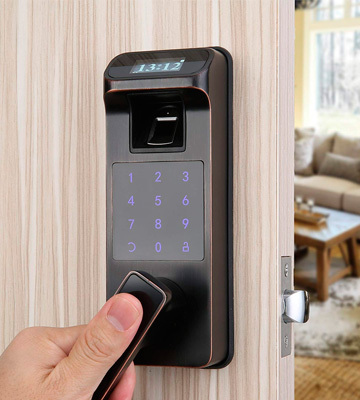 All in all, if you’re not a techie, the HARFO HL91 is an easy and secure biometric locking system that will keep your home protected. It’s not perfect for offices as frequent use will whittle down the batteries, but, as far as home security goes, this is one of the top choices. 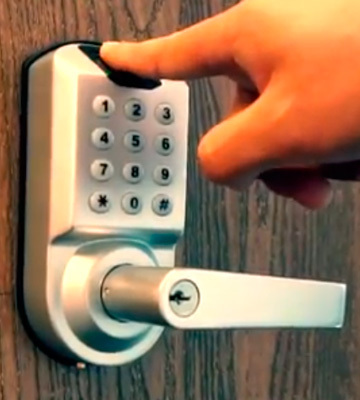 Smart locks are a must for offices these days as protecting your documents and data is important at all times. 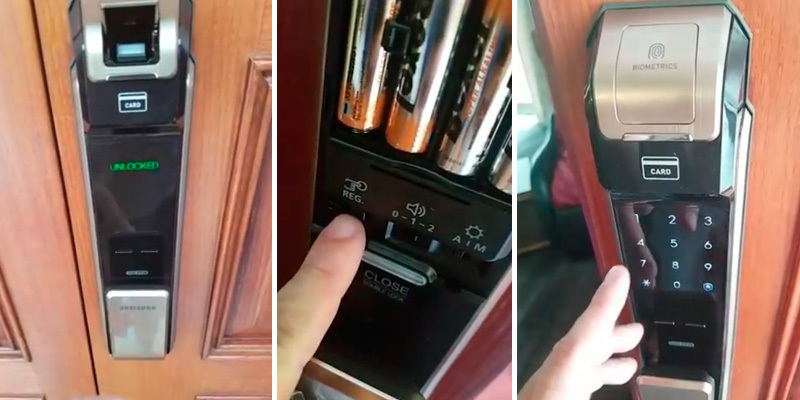 However, most cheap fingerprint door locks tend to eat through batteries like they’re nothing, requiring frequent swaps. Thankfully, there are budget-friendly models that you can install for a whole office and use for a while with no battery changes. Chief among them is the excellent ZKTeco PL10-B. This model only needs 4 AA batteries to run and those are enough for 6000 lock uses. Even if you install it on an office door with many people coming through, the batteries should last for up to 1.5 years. However, we still suggest keeping track of when a swap is needed because opening the lock with a key (when it’s not operational) is a bit of a hassle as you have to take off the whole handle to reach the keyhole. Speaking of alternative opening methods, you can use your phone (as long as it has Bluetooth and runs Android or iOS) to disengage the lock or actually block it using the special ZKBioBT app. 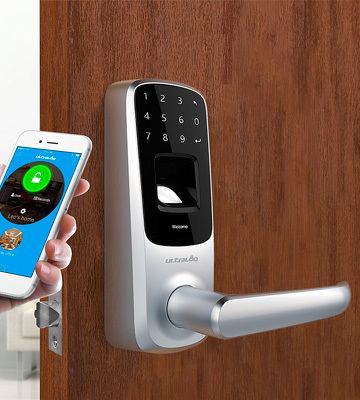 So while there are certainly more high-end and more expensive models out there, the ZKTeco PL10-B is an affordable and durable smart lock system that’s a perfect fit for office use. It’s reliable, secure, and runs for a while without any need for a battery swap. 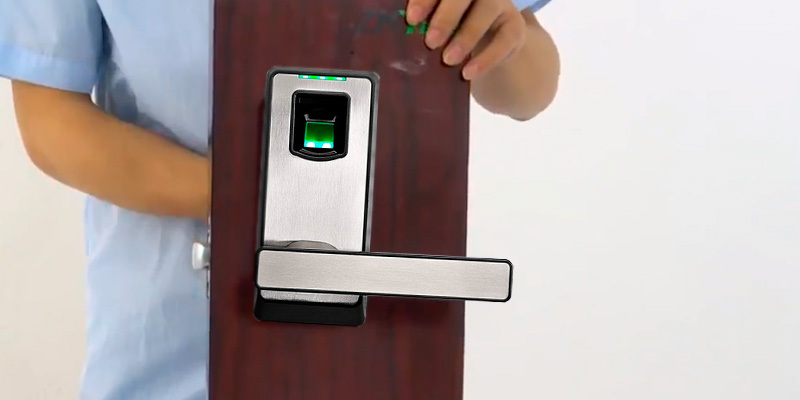 What Is a Fingerprint Door Lock? 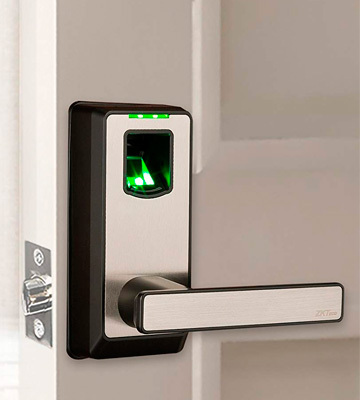 At its core, a biometric door lock is simply a fingerprint reader that, when interfaced with using the right digit, grants access to premises, residential or otherwise, that would regularly be off-limits. It’s a good digital security device to prevent external intrusion into your private life, be it your house or your office space. Most of these are programmable and can recognize several fingers or, if you’d prefer to give access to a wider selection of people, rely on a password that can be typed in via a keypad. That option isn’t the most secure but it’s still far above a regular door with deadbolt. Every day, biometric technology is getting better and fingerprint recognition software is becoming more sophisticated. 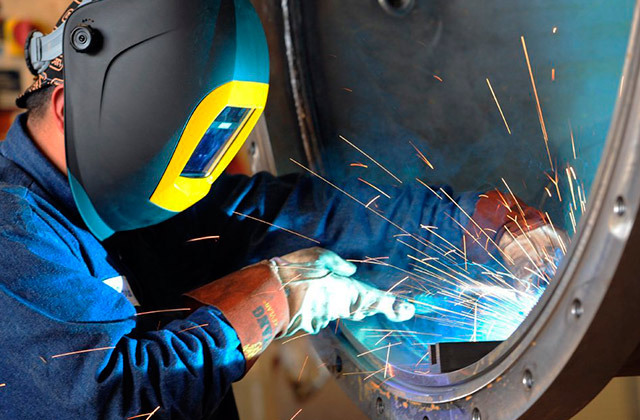 Soon, an electronic scanner will be your best bet in achieving high security without wasting your budget on hiring specially trained personnel to stand watch over your property. 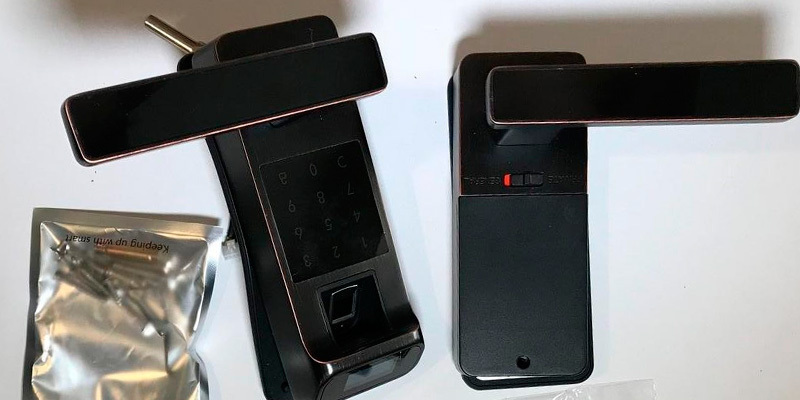 Gaining access to a room protected by the best fingerprint door lock available on the market won’t be possible to most people and even if an experienced hacker tries it, the entry system will delay his entry long enough for the criminal to be caught. 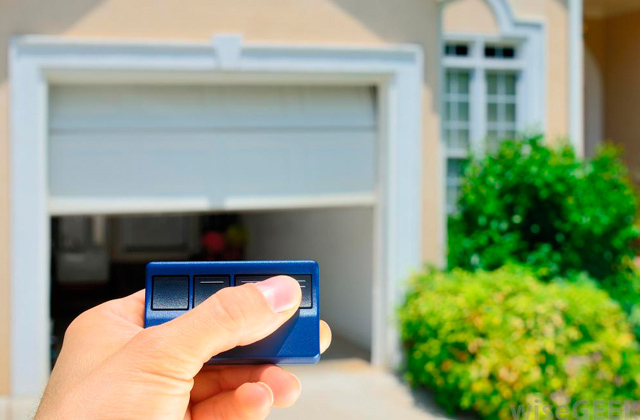 As long as you’re looking for tech for home security, consider getting home security systems that offer a full package of protection or at least a set of security cameras to watch any exterior door, making sure that everything’s okay outside.